Democratic Republic of Congo, a country that has been ravaged by civil war in the 20th century, is treading the long road back to peace and civility. Mineral resources and the manner in which they have been exploited have been at the heart of DRC’s violence, anguish and misery. Artisanal mining has directly contributed to the formation of armed militias on the back of profits made and traded. The low-tech miners have destroyed potentially billions of dollars of value to the national finances through cherry picking the highest-grade areas of large deposits rendering them uneconomical for commercial exploitation. 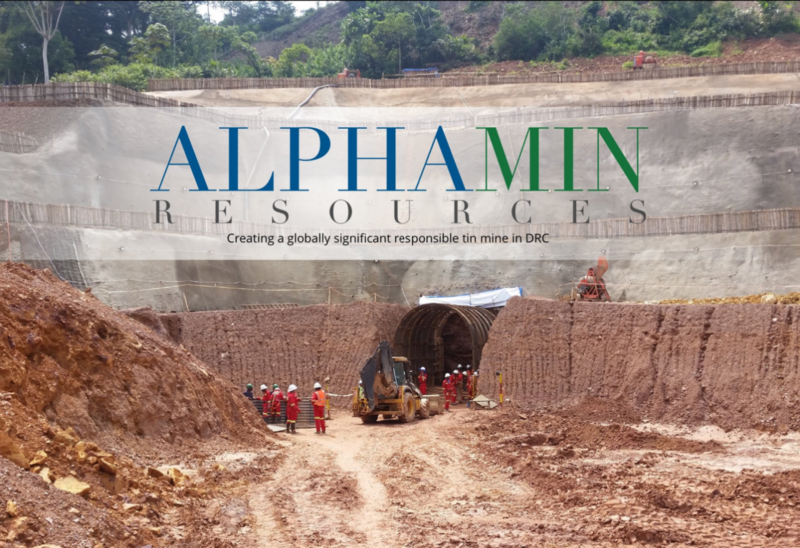 Alphamin is a TSXV-listed company trying to change things in DRC. With a commitment to conflict-free, responsible tin mining CEO Boris Kamstra hopes the Bisie tin project will act as a catalyst to a new chapter in DRC’s mining story. The Bisie tin project comprises a host of highly mineralised zones located in the deep jungle in DRC’s North Kivu region, Kamstra has no doubt that it is one of the ‘world’s most significant tin deposits’. At one point Bisie was producing 4% of the world’s tin but the riches that produced never trickled down to the local community. That can be attributed to the business structure of artisanal mining, however, Alphamin is committed to stimulating real economic prosperity and development through Bisie. The company completed a DFS followed up by a comprehensive budget estimate to execute the project and the results were outstanding. Kamstra calls the project’s economic metrics absolutely stellar and Bisie will provide the necessary cashflow to support further exploration in the nearby areas. Alphamin is developing Bisie’s Mpama North deposit first and Kamstra is right, the economics of the project are impressive. Mpama North has a 12.5-year life with a post-tax NPV of US$402.2 million and a post-tax IRR of 49.1% positioned against a capital expenditure of $124.4 million, peak funding of $152.0 million. The company’s aim is to get Mpama North up the development curve and in a positive cash flow position in order to drill out the rest of the mining licence. “We needed to find a starter project. A project where we could define the resource, get sufficient tonnes into our measured/indicated categories, around which we could build a project that made financial sense and get cash that would allow us to explore the rest of the area,” explains Kamstra. When Alphamin set out on the drilling process for Mpama North it had identified a likely 100,000t contained tin at a grade of 2.5% hoped for. But, to everyone’s surprise, after 40,000m of diamond drilling the deposit was showing 230,000t contained tin at 4.5%. Kamstra and the team were ecstatic with the new grades but due to the disparity from their predictions, the results were subject to independent verification from MSA and DRA and passed with flying colours. From a financial perspective Alphamin is in a favourable position to secure the funding necessary to build the mine. With US$80 million signalled in debt funding, Kamstra is now going to the markets to raise the balance of the capex in equity. This year the focus has been on preparing the project to receive the main construction work. Next year the civil work will begin, before the SMPP contractors install the process plant which will be commissioned in 2019 with a target for steady state production in the second half of 2019. Operating in DRC offers a whole range of unique challenges that have to be overcome, particularly in the remote jungle where Bisie is situated. A lot of the challenges are common for frontier mining projects, such as local skilled labour, infrastructure access, government relations and communication networks. However, with the fragile nature of DRC’s tribal villages and the often-bureaucratic dealings with government, Alphamin has had to approach the project with special care. When it came to looking at how to develop the project the first major hurdle was even just to get access to the site. When Alphamin first started at Bisie there were only two ways to access to project; by helicopter or a two-day trek through the jungle. The initial work was completed by helicopter and limited drill rigs which has led a to a ‘false horizon’ on the mineralisation, in that with full size rigs Kamstra believes the resource goes much deeper than has been drilled out so far. Bisie is surrounded by thick jungle and difficult terrain. The nature of the jungle with ravines, steep climbs and rivers at any point made the mission to build an access road fraught with difficulty. But without light vehicle access the project would not come to fruition and the locals would not reap the benefit of a usable road through the mountain range. “The solution was to tape a GPS to my back and walk the forest. We had to build up our knowledge of the terrain and plot the route by foot, we eventually found a watershed along which the bulk of the road runs. Despite the achievement of getting the access road built, Kamstra maintains that logistics remain the biggest problem. The main road between Goma and Walikale, the district Bisie is in, has seen major floods and Alphamin has had to reroute trucks. However, it has now established supply lines to both the East and West and is providing $4.5 million to improving the road from Goma. The through pass from East to West will unlock a raft of economic potential in the area. Previously the fertile agricultural fields struggled to reach their capacity with poor transport routes but Alphamin’s investment will see new opportunities from trade and commerce for local producers. “We always said that when we build Bisie we will be an economic catalyst for the entire region. We are seeing it happen now, our road repair initiative is getting more support because the route joins Mombasa on the Indian Ocean to the Atlantic coast and you can now get goods across the continent,” notes Kamstra. “The extraordinary agriculture area hasn’t been able to access markets in the West because of a lack of travel routes. The agricultural potential is running at a fraction of what it should be,” with the new road farmers will be able to realise the full value of their crops. In addition to developing a world class tin project it is these types of developments for the local population which really set Alphamin and Bisie apart from what has gone before. Not only the project itself but the way Alphamin has gone about working with the community and stimulating the local economy. There was understandable distrust when the company first approached the local communities, but through a process of mediation using the catholic church and the local leaders, as well as the promise of jobs and economic generation, Alphamin has been accepted as a vital component for development of the North Kivu region’s future. “Our thesis is that Bisie tin should be a premium product in that everything that has been levied against the tin industry in DRC, Alphamin is the direct opposite,” says Kamstra referring to a recent visit by the North Kivu minister of mines Anselme Paluku Kitakya who described the project as a ‘beacon of hope’ for DRC and its history. The commitment Alphamin has made to local prosperity comes in the form of jobs and economic stimulus. Alphamin’s focus has been to keep all the work as labour intensive as possible to bring as many people into employment as it can. Where the choice is between one excavator or 200 men for a task, Kamstra will always favour the manual labour. In terms of blooding new markets and industries in the area there are no better examples than the mining company’s need for access and communications spinning off into wider economic generation. As discussed, building the road opened new trade routes and opportunities for local farmers and tradesmen and when Alphamin needed a communication network, Vodacom installed a telephone mast in the area. Quickly a budding telecommunications market sprung up in the villages with airtime vouchers being sold, phones being rented by the call and electric recharge being purchased. There were also a number of lifechanging social benefits to the new telephone network. If people were sick or under criminal threat they could quickly make a call to Goma for medical or police aid, instead of sending a porter which could take up to two weeks and has an associated cost. Another development which changes the landscape for the population of Bisie is the new bank that Alphamin requested be built in the village. “We try to use local contractors as much as possible and we have a complete aversion to cash payments. When we tried to pay one contractor by electronic transfer he said it wasn’t worthwhile as he had to travel all the way to Goma and back just to get the money. “We went to Trust Merchant Bank and said we need a bank on site and they are bringing in the facilities. Looking forward to how Alphamin can deliver its goal of creating a globally significant tin precinct, Kamstra is focused on getting Mpama North into production before widening the net of drilling programmes to incorporate new deposits in the immediate area. Even at Mpama North the life-of-mine is stated at 12.5 years and because of the amount of contained tin already proved, there was no pressing need to continue to spend shareholders money on expensive drilling, although Kamstra is confident there is high grade mineralisation that extends deeper into the mountain. Following Mpama North’s ramp up, Alphamin will turn its focus to Mpama South, a second deposit which is showing similar geology and mineralisation trends to the cornerstone resource. “We will be generating a lot of cash [from Mpama North] so our first priority has to be to pay down our debt, secondly we will provide our shareholders with dividends and then retain a portion of the cash to start drilling programmes. “We will first target Mpama South and what you have to bear in mind when you look at the increase potential at the project is that Mpama North has had to bear the costs of all the infrastructure and the overheads. If we add units all we are picking up is the operating costs but all of the revenue.